The Altalena, purchased by Irgun members abroad, was originally intended to reach Israel on May 15, 1948, loaded with fighters and military equipment. Weapons purchase and organizational matters took longer than expected, however, and the sailing was postponed for several weeks. Meanwhile, on June 1st, an agreement had been signed for the absorption of the Irgun into the IDF and one of the clauses stated that the Irgun had to cease all independent arms acquisition activities. Consequently, representatives of the Israel Government were informed about the ship and its sailing schedule. Historical footage of the Altalena affair. The Irgun headquarters in Paris did their best to keep the Altalena's preparations for departure a secret, but it was difficult to conceal the movement of 940 fighters and the loading of a large quantity of arms and ammunition. It was feared that if the plans were discovered, attempts might be made to sabotage the Altalena at sea. For this reason, when it raised anchor on June 11th, no cable was sent to the Irgun command in Israel, for fear that it would fall into the wrong hands. These precautionary measures proved fruitless, however, and the following day Radio London reported that the Altalena had sailed from Port-de-Bouc (France) in the direction of Israel with 1,000 Jewish volunteers and a large quantity of weapons on board. It should be recalled that the first truce had begun on June 11th. When the Irgun leaders in Israel learned through the broadcast of the embarkation of the vessel, they feared that this breach of the truce conditions (i.e., the ban on bringing military equipment and fighters into the country) would be revealed. 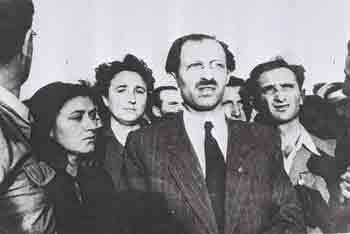 Menachem Begin decided therefore to postpone the arrival of the ship, and the Irgun staff secretary, Zippora Levi-Kessel, sent a wireless message to the Altalena to stay put and await orders. A similar cable was sent to Shmuel Katz (member of the General Headquarters), who was then in Paris, but contact with the ship was poor and the message was not understood. Yisrael [Galili] and Skolnik [Levi Eshkol] met yesterday with Begin. Tomorrow or the next day their ship is due to arrive: 4,500 tons, bringing 800-900 men, 5,000 rifles, 250 Bren guns, 5 million bullets, 50 Bazoukas, 10 Bren carriers. Zipstein (director of Tel Aviv port) assumes that at night it will be possible to unload it all. I believe we should not endanger Tel Aviv port. They should not be sent back. They should be disembarked at an unknown shore. Galili informed Begin of Ben-Gurion's consent to the landing of the ship, adding a request that it be done as fast as possible. Zippora Levi-Kessel then wirelessed the vessel to come in at full speed. The following day, a working meeting was held between Irgun representatives and Ministry of Defence personnel. While the Irgun proposed directing the Altalena to Tel Aviv beach, Ministry of Defence representatives claimed that the Kfar Vitkin beach was preferable, since it would be easier to evade UN observers there. The ship was therefore instructed to make for Kfar Vitkin. Whilst there was agreement on the anchoring place of the Altalena, there were differences of opinion about the allocation of the cargo. Ben-Gurion agreed to Begin's initial request that 20% of the weapons be despatched to the Jerusalem Battalion. His second request, however, that the remainder be transferred to the IDF to equip the newly-incorporated Irgun battalions, was rejected by the Government representatives, who interpreted the request as a demand to reinforce an 'army within an army'. This was far from Begin's intention; rather, he saw it as a question of honor that the fighters enlist in the IDF fully-equipped. We must decide whether to hand over power to Begin or to order him to cease his separate activities. If he does not do so, we will open fire! Otherwise, we must decide to disperse our own army. By special order from the Chief of the General Staff of the Israel Defence Forces, I am empowered to confiscate the weapons and military materials which have arrived on the Israeli coast in the area of my jurisdiction in the name of the Israel Government. I have been authorized to demand that you hand over the weapons to me for safekeeping and to inform you that you should establish contact with the supreme command. You are required to carry out this order immediately. If you do not agree to carry out this order, I shall use all the means at my disposal in order to implement the order and to requisition the weapons which have reached shore and transfer them from private possession into the possession of the Israel government. I wish to inform you that the entire area is surrounded by fully armed military units and armored cars, and all roads are blocked. I hold you fully responsible for any consequences in the event of your refusal to carry out this order. The immigrants - unarmed - will be permitted to travel to the camps in accordance with your arrangements. You have ten minutes to give me your answer. The ultimatum, and in particular the demand for an answer within ten minutes, was insulting and unrealistic. It was made, according to Even "in order not to give the Irgun commander time for lengthy considerations and to gain the advantage of surprise." Begin refused to respond to the ultimatum, and all attempts at mediation failed. Begin's failure to respond was a blow to Even's prestige, and a clash was now inevitable. Fighting ensued and there were a number of casualties. In order to prevent further bloodshed, the Kfar Vitkin settlers initiated negotiations between Yaakov Meridor (Begin's deputy) and Dan Even, which ended in a general ceasefire and the transfer of the weapons on shore to the local IDF commander. Begin had meanwhile boarded the Altalena, which was now heading for Tel Aviv. He hoped that it would be possible to enter into a dialogue with the Provisional Government and to unload the remaining weapons peacefully. But this was not the case. Ben-Gurion ordered Yigael Yadin (acting Chief of Staff) to concentrate large forces on the Tel Aviv beach and to take the ship by force. Heavy guns were transferred to the area and at four in the afternoon, Ben-Gurion ordered the shelling of the Altalena. One of the shells hit the ship, which began to burn. There was danger that the fire would spread to the holds which contained explosives, and the captain ordered all aboard to abandon ship. People jumped into the water, whilst their comrades on shore set out to meet them on rafts. Although the captain flew the white flag of surrender, automatic fire continued to be directed at the unarmed survivors. Begin, who was on deck, agreed to leave the ship only after the last of the wounded had been evacuated. 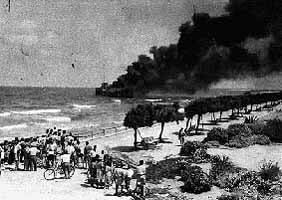 Sixteen Irgun fighters were killed in the confrontation with the army; six were killed in the Kfar Vitkin area and ten on Tel Aviv beach. Three IDF soldiers were killed: two at Kfar Vitkin and one in Tel Aviv. After the shelling of the Altalena, more than 200 Irgun fighters were arrested on Ben-Gurion's orders. Most of them were released several weeks later, with the exception of five senior commanders (Moshe Hason, Eliyahu Lankin, Yaakov Meridor, Bezalel Amitzur and Hillel Kook), who were detained for more than two months. (They were released, thanks to public pressure, on August 27, 1948). Years later, on the eve of the Six-Day War, in June 1967 (after Ben-Gurion had retired from political activity and Levi Eshkol was Prime Minister), Menachem Begin joined a delegation which visited Sde Boker to ask David Ben-Gurion to return and accept the premiership again. After that meeting, Ben-Gurion said that if he had then known Begin as he did now, the face of history would have been different. 1. Menachem Begin, The Revolt, (NY: Nash Publishing, 1977), p. 224. 2. J. Bowyer Bell, Terror Out Of Zion, (NY: St. Martin's Press), p. 172. 3. Anne Sinai and I. Robert Sinai, Israel and the Arabs: Prelude to the Jewish State, (NY: Facts on File, 1972), p. 83. 4. Benjamin Netanyahu, ed., "International Terrorism: Challenge And Response," Proceedings of the Jerusalem Conference on International Terrorism, July 2­5, 1979, (Jerusalem: The Jonathan Institute, 1980), p. 45.